with warm gingerbread and cocoa, and garlands of pine. So I made all this today! You'll be using my Build a House crafting die from Spellbinders Paper Arts. 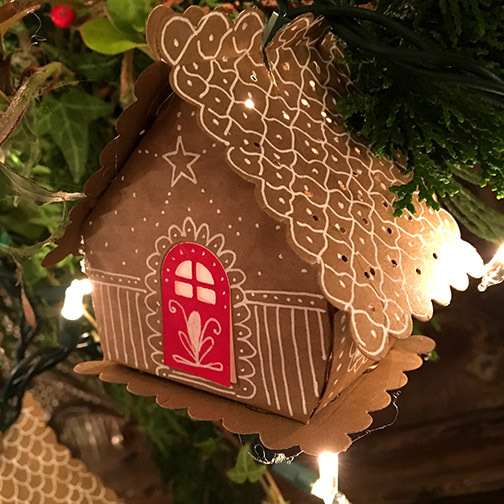 It's a jiffy way to cut out all the pieces you need to make this darling gingerbread cottage. Simply use the die pieces to cut out all the pieces for your house. Then use a white pen (I love the UniBall white Signo pens!) 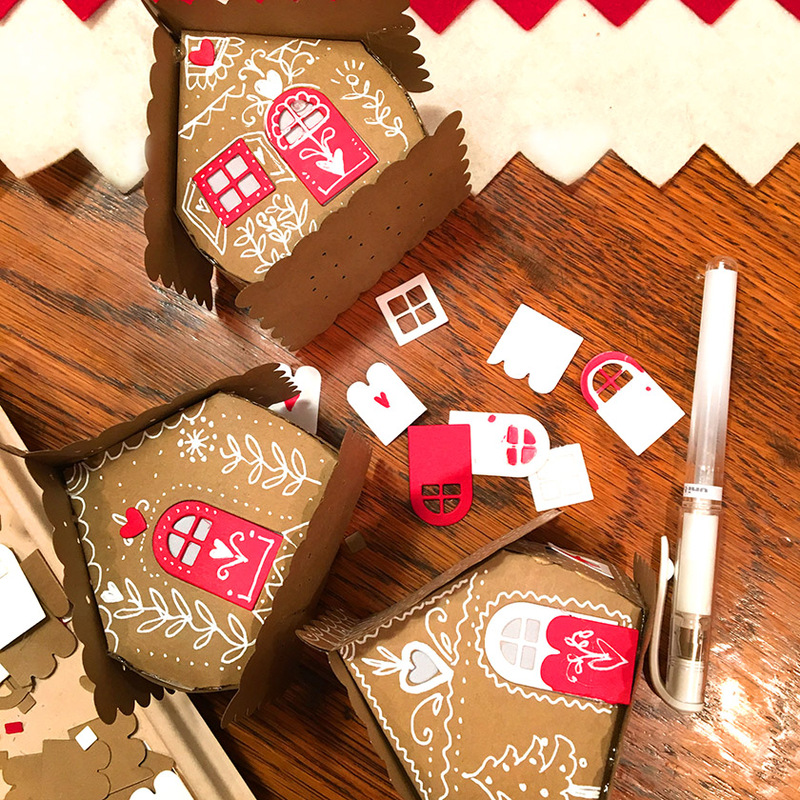 Decorate to your heart's content, then glue the little houses together as shown on the package. You'll want to use tracing paper or vellum behind the windows and doors to allow for the light to shine through. Cut an X in the roof or floor of your little houses so you'll be able to tuck a twinkle light in through the hole. Now hang a pine garland on a window or wall and wrap it with twinkle lights. You can purchase the garland, or do as I did and gather a variety of fresh evergreens, berries, holly and other greenery and tie and wrap it together into a long garland. Stick the houses on by pushing a twinkle light in through the X hole you made earlier. 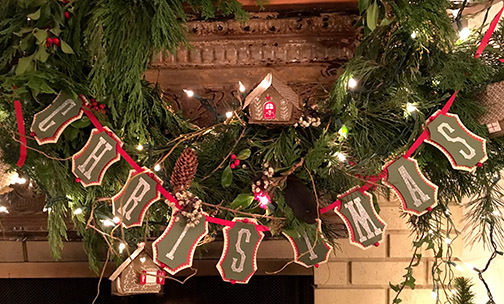 I decided to use paper scraps, glitter and some ribbon to spell out Merry Christmas as a finishing touch but you can do whatever works for your home, using whatever you have on hand. Doesn't it look wonderful? Turn up the Christmas music and celebrate! And now for two happy giveaways to make it even sweeter. Wouldn't you love to win a $50 gift certificate for this and other crafty dies? Spellbinders Paper Arts is giving 5 gift certificates away! Just leave a comment on theSpellbinders blog by Sunday, December 10 11:59PM EDT for a chance to win. Winners will be announced in the blog hop post on Spellbinders blog on December 11. I'll also be giving away a $25 gift certificate to spend on Spellbinders crafting dies and stamps! Just comment below, and I'll announce the winner on December 11. Doesn't that sound wonderful? Now time to make yourself a cocoa and pop over to the next blog on our Spellbinders Holiday Blog hop... Click here for more inspiration. This is Wonderful!!!! Soooo Cute!!!! These little houses look good enough to eat! Beautiful Christmas projects! Another great release from Spellbinders! 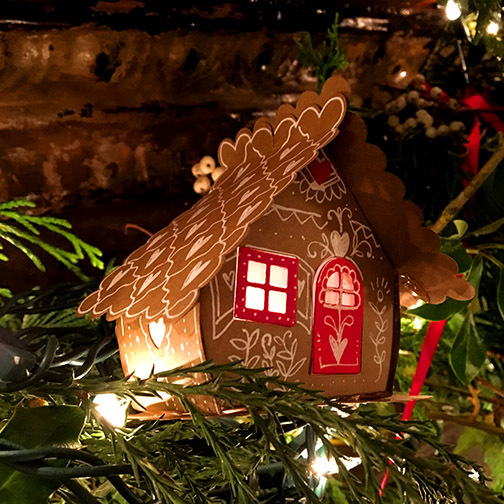 Love the darling gingerbread house and pretty garland you made Thanks for sharing. Love gingerbread houses, I want to build a whole village!! Those gingerbread houses are just too cute! Those gingerbread houses are so cute. Love your gingerbread houses! Super cute! 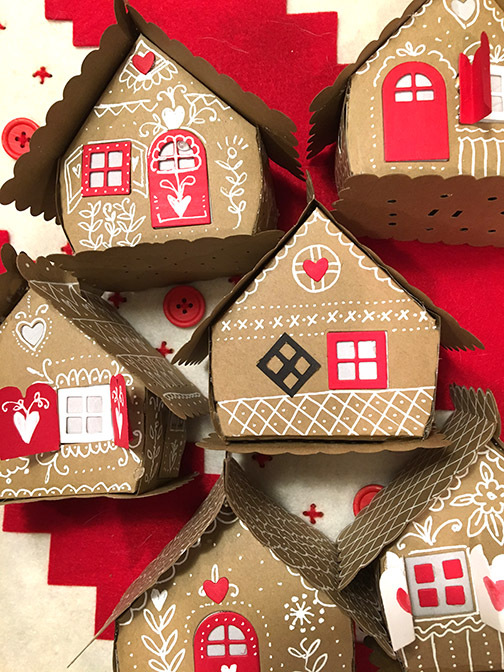 Oh my, these gingerbread houses are so adorable!! What a great new die especially since we can make these and use them year after year! They would make such adorable gifts as well! Love Spellbinders for great products like these! Love that gingerbread house garland! So cute!!!! Love the gingerbread houses - how fun to do the garland too. I just love all the little gingerbread houses. Beautiful garland, so festive. Thank you for your inspiration. Very sweet and so cute. Those gingerbread houses are too cute! Very cute gingerbread house themed decorations for your fireplace. Ahh, Love the picture you showed first, it is so cozy, I could feel the warmth. Your Gingerbread house is amazing, I loved it. It was so cute, just adorable and maybe something the kids could help with, they would love that. GREAT project and Thanks for sharing it with us. Tracey Magner. This is wonderful! I am excited to make these with my granddaughter! She just made a real gingerbread house wth her 96 year old great grandmother❤️. That garland is super cute! Love your gingerbread house! What a great idea for your mantle! Thanks for sharing and have a wonderful week! the little houses and the garland are darling and make a wonderful "cozy" scene! WOW! Beautiful - a lot of work with the white pen. However, it really makes them look nice! Absolutely adorable! They look so warm and cozy. This is such an amazing project! Thanks for sharing! And they are just for the holidays. for any occasion or holiday. Wonderful hardly describes it. These little houses are so amazing. Love the details and how great they accent the greens. Nicely done. Adorable gingerbread houses! They go beautifully with the garland. Very festive and cozy! I adore these quaint and rustic little houses! What is really cool is that by changing the paper that you use you can change the whole vibe! These would be great for making little villages to place around the house in unexpected places! I am thinking of the bathroom, a child’s windowsill or in the laundry room to bring the festivities into every nook and cranny! TFS! I love the little houses. There's so much you can do with them. These gingerbread houses are just the sweetest things! So much you can do with them. Your idea is perfectly suited for these little houses. No need to score the houses, as the die is already scored and will easily open just as you describe. Keep your eyes on this blog... you'll see how it works on another post very soon. Oh my! Those gingerbread houses are adorable! You are so clever! OMGoodness, the cuteness! I have been obsessed with gingerbread men for my cards this year and now I see I need a gingerbread house! LOVE! Love your gingerbread houses with your garland. So festive!! Lovely!!! The gingerbread houses!!!!! Swoon!!! Love these!! Sharyn, these are absolutely delightful and YES, it does look cozy, a very homey scene. Your ginger bread die is just sweet. A great design. This is the most impressive mantle décor I've ever seen. I'm wondering how many days you spent creating it. This is so cute and creative. MtScrapGal, Thank you so much for the very sweet comment. Actually I spent an afternoon and evening making all the houses assembly line style. To make the garland I picked up a large shopping bag of downed branches and other things I found on our rural road while I walked the dogs. There were no large branches; they were all just little bits of this and that. The garland was made in 90 minutes, made by using up the end of a ball of garden twine. I put the greens together on newspapers on the living room floor and simply tied sprigs together over and over until it was long enough, then hung it on the mantle with three clips from the junk drawer. Nothing fancy, nothing store bought! What an awesome idea! Your gingerbread houses are stunning! You can make them all unique! Thanks for the inspiration and for the opportunity to win! This is such a creative project! It's always a pleasure to decorate with DIY items. Oh my... Your fire place looks so lovely, warm and very inviting! Such cute and adorable gingerbread House and Banners!!! Such sweet decor items. These are perfect for older kids to work on too. Great ideas Sharyn. What a charming idea and sweet project. It would be great fun to do with a somewhat older crafty child. : ) Such a lovely final result. Such a beautiful scene you created and the gingerbread house are adorable! So inventive, love gingerbread houses. These are so darn cute. I’m going to have to make this for next year when Christmas is at our home. Such a great project! Thanks for sharing! WOW!!! This is so awesome! !I even have the house die set! These are so amazing! They are so festive and impressive. What a great set of dies! Love these sweet little houses! So unique & cute! I love the gingerbread house. Very pretty. Super cute gingerbread houses...love them!! Gorgeous houses - they look so pretty and fun! I absolutely love your gingerbread houses with the vellum windows! Wow, love the gingerbread houses and the banner, super cute! Oh my goodness, your gingerbread houses are adorable! And to string them in a garland—what an awesome idea! Your mantle looks beautiful! Looks so fun and festive! Wow! Your decorations look wonderful!! Merry Christmas!! Those are wonderful. So adorable. Fabulous creativity - thank you for sharing your project and talent. I'm in love with the Build a House die.... had not seen it yet! Absolutely delightful project! Your mantel looks fabulous! Love the gingerbread house. Thanks for sharing. Your photo took my breath away! I love this garland with those sweet gingerbread houses nestled in the white lights on your fireplace mantel. Thank you for sharing your creativity and for the inspiration! This is just amazing...you are so right...warn and cozy and perfect for the holidays. I just love that little gingerbread house! And the whole garland is brilliant. Cheers. This is amazing...love this idea. Wonderful ideas! The garland is beautiful and I love decorating cookies for Christmas, so the gingerbread is right up my alley. Great Spellbinders stamps & dies. Just darling! Love the gingerbread houses! Best Christmas project EVER! Love your gingerbread houses!! TFS! Such adorable ginger bread houses! Your fireplace looks so festive and cosy! Those little gingerbread houses are DARLING! Now I've got a hankering to go eat some gingerbread. lol! Those gingerbread houses are adorable. They make a cute addition to the tree. The Kraft Gingerbread houses are wonderful looking. Especially like the use of the white pen. I’d love nothing better!!! Just send your address (wink, wink!) I’ve always wanted to visit Maine! Oh my goodness, your little houses are fabulous! 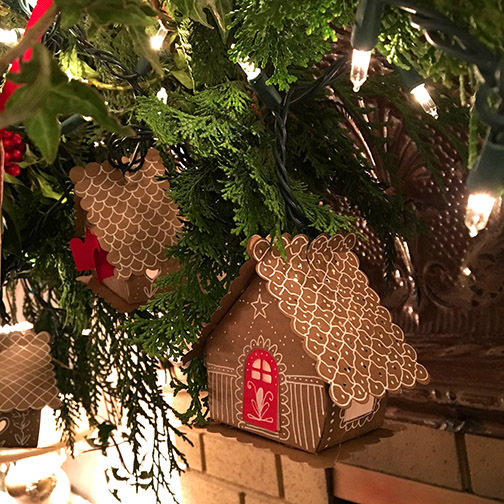 Love how you created these gingerbread boxes into ornaments. Love these gingerbread houses!It's really fabulous idea! The garland and houses are super cute! Fantastic gingerbread houses! Such a creative way to decorate! The gingerbread houses are sooooo cute! tea light or some ginger cookies inside. Also great looking on the tree! I love everything you did. So beautiful. Thank you for sharing. Wow! The houses are amazing! Great garland. Great die set too. I stink at making gingerbread so this would be a perfect option. Thank you for sharing. Wow! So cute! Love those gingerbread houses! Such beautiful creations! I love the adorable gingerbread houses and beautiful garland!! Love the Kraft and red combo for Christmas! These are genius! Love the details done with the white pen! So pretty!!! Beautiful garland! 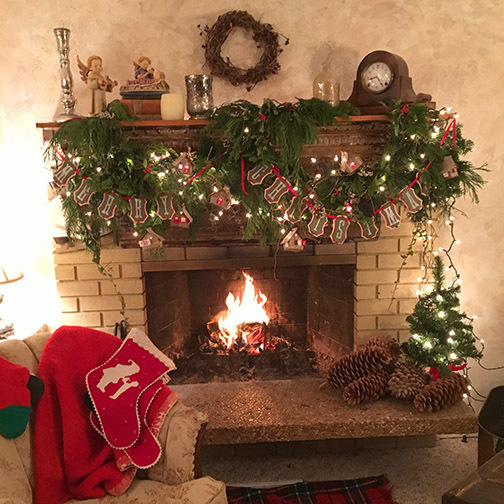 Your fireplace looks so cute and cozy! So beautiful! I can picture those cottages as gift boxes, ornaments, a village display. Even for non-Christmas. Those paper houses, nestled in between the cedar bough, look amazing! Creative. Living. A challenge for the year ahead.